When they need to find a highly skilled DermaFrac practitioner, Modesto residents know to choose the Skin Renew Laser Medical Center. The Center provides only the highest quality skin care and the most up-to-date restoration technologies. No matter the issue, our powerful skin rejuvenation techniques will restore elasticity, improve coloration, combat acne, reduce scarring, and more. Living in Modesto can be hazardous to your skin. Dry air, sun exposure, dust, and more can affect your skin’s health. You may not want to try laser skin care treatments for any number of reasons, and in that case, there’s an option for you. DermaFrac is a breakthrough technology that avoids many of the downsides of laser treatment, such as the heat or need for anesthesia. This revolutionary skin treatment allows beneficial topical treatments to infuse more deeply into the skin when using DermaFrac. Modesto isn’t too familiar with this technology yet, as it’s only recently come over from Europe and Asia, and the results are incredible. This is a technique ideal for darker complexions or skin types that have higher risks when receiving laser treatment. 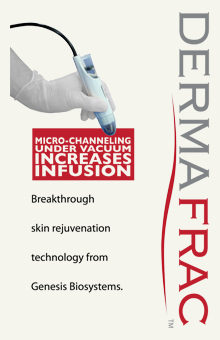 DermaFrac is painless and can easily infuse treatments for anti-aging, acne, moisturizing, and more. Wherever you are in Modesto and whatever types of treatment you need, from tattoo removal to a chemical peel, the Skin Renew Laser Medical Center can provide.